I wanted to share with you an e-mail that I received from Robin Maxwell, author of the upcoming book O, JULIET. 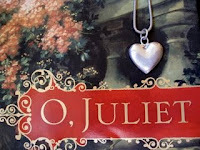 Beginning Monday, January 4th, and on the next two Mondays, readers can enter to win a signed copy of O, JULIET and a beautiful heart necklace (one hand-crafted solid silver, one blown glass, and one carved Thai silver) on my blog, http://robinmaxwell.blogspot.com. All you have to do is provide your e-mail address and answer a simple questions about love. This week's questions is: "What are the qualities in a lover that are most important to you?" Make sure you visit Robin Maxwell's blog to enter this contest! The two things I look for are honesty and trust. I'd love to be entered in your giveaway. Enjoying your blog. Thank you!